In light of a recent report examining the concentration of wealthy students in American universities, calling Northwestern an incubator for middle-class renewal seems disingenuous. The report revealed that most college students at elite universities come from the upper echelon of American society. In fact, thirty-eight institutions enroll more students from the top 1 percent than students from the bottom 60 percent. Obama’s embrace of higher education — long touted by Democratic politicians as the key to a good, stable life — ignores the class dynamics at selective, high-tuition universities and reflects liberals’ silence around class issues more generally. At a time when most poor students can’t afford tuition at even underfunded public universities, this claim rings especially hollow. The United States’ elite universities aren’t engines for meritocratic uplift — they preserve and reproduce inequality. Wealthy parents can buy their children into a good school with a strong brand name and a $70,000-plus tuition bill without giving it a second thought. These schools admit and fund a handful of low-income students so they can call themselves economically diverse institutions, even as those students cannot afford to participate in many of their institutions’ quintessential experiences, such as study abroad trips or unpaid internships. A handful of inspiring stories, Barack Obama’s being perhaps the most visible, justifies a system that still prevents most low-income families from sending their children to top-ranked colleges. Northwestern’s numbers aren’t pretty: the median family income sits at $171,200, and two-thirds of students come from the top 20 percent. Of those, 14.1 percent come from the 1 percent —almost equal to the entire population of those from the bottom 60 percent, who only constitute 16.8 percent of the student body. And Northwestern doesn’t have the worst record. Colorado College, a small liberal arts school, had the second-largest split between high- and low-income students: almost a quarter of its students come from the top 1 percent and only 10.5 percent come from the bottom 60 percent. Most universities, Northwestern included, boast about meet[ing] the full demonstrated institutional financial need of our aid applicants” but then present low- and middle-income students’ families with their “Expected Family Contributions.” Countless parents either cannot meet those expectations or take out massive loans to cover the costs. Despite having a $10 billion endowment, Northwestern leaves its average student $23,051 in debt. Slightly less than the national average of $30,100, this burden nevertheless cripples students as they enter a still-shaky job market. The school recently announced that it would eliminate loans from their financial aid packages and replace them with grants, but it remains to be seen how the change will work in practice. Will it realign the school’s class ratio or will the Expected Family Contribution still be too high for most families? Today, many students accept that they must take on tens of thousands of dollars if they want a college degree. Obama knows this: between their undergraduate and law school educations, he and Michelle Obama carried more than $120,000 in student loan debt. They only paid off when he secured a million-dollar book contract. Rather than recognizing the unfairness of saddling students with unpayable debt (after all, how many of us get seven-figure book deals to wipe out our financial obligations? ), Obama continued to insist that taking out loans was a good idea, rather than a product of a system designed to make a college degree a burdensome necessity. “It remains smart to spend on things that are going to increase your productivity and your income over the long term,” he said in a White House briefing. Never mind that the ratio of students from the top .1 percent who attend an Ivy League or other elite school — four in ten — matches the percentage of low-income students who attend any two- or four-year institution. Simply put, 60 percent of low-income students never have the opportunity to take out loans in the first place. Most elite schools claim that they evaluate students’ merits regardless of their financial situation — what they call need-blind admissions — but they nevertheless reward applicants for high SAT and ACT scores. All evidence shows those scores rise with family income and parental education. And most elite schools continue to use legacy admissions to give students with family alumni an extra advantage. Northwestern’s low-income students have organized to demand more resources and support. In 2008, the school joined Questbridge, a network of universities that offer poor students full-ride scholarships. While it began as a scholarship program, student activists have transformed the group into a community space for all low-income students; it stands in stark contrast to other campus experiences like Ski Trip, a pricy weeklong binge in Colorado that regularly draws more than one thousand students. The divisions between the rich and everyone else became visible in 2014, when Questbridge launched NU Class Confessions, a Tumblr encouraging students to anonymously post comments on class issues. Wealthy students complained about the imagined benefits of receiving financial aid. “I know I shouldn’t judge, but it makes me mad when my friends with lots of financial aid seem to have more spending money than I do.” Some suggested that poor students should feel obligated to choose a “profitable” major like economics or biology. The university has not completely ignored this student organizing, creating an office called Student Enrichment Services to ensure low-income students can enjoy more of the school’s extracurricular perks. Still, it’s telling that an SES mentorship program is called Compass, reflecting that low-income students have to navigate a world not designed in their interests. Transitioning to an educational system that actually supports working-class students seems unlikely right now. Bernie Sanders’s proposal for free public universities resonated with many young people who are suffering in today’s job market even with an expensive college degree. Since 2008, government funding for public universities has shrunk by nearly $10 billion, with per-pupil spending falling 18 percent. As lawmakers starve state-supported education, private institutions’ vast resources look increasingly appealing to students. But that doesn’t need to be the case — we already have numerous successful models of thriving, class-inclusive American public universities. The City University of New York system shows that large-scale, well-funded institutions of higher learning can expand access to working-class populations. In fact, five CUNY colleges appear in the top twenty of the 2016 Social Mobility Index, which measures how effectively schools provide low-income students with a low-tuition education and allow them to avoid taking on debt . The City College of New York, founded in 1851 as the nation’s first free public university, became known as “the Harvard of the proletariat” for successfully educating “the children of the whole people.” City College also established the nation’s first degree-granting evening program, offering numerous opportunities for workers with full-time jobs to work towards a college degree. The CUNY network today serves nearly 275,000 degree-seeking students. But the neoliberalization of public education has been particularly hard on CUNY students. Between 1990 and 2010, the percentage of funding derived from student tuition at senior colleges nearly doubled, from 21 percent to 41 percent. And in 2016, Governor Cuomo proposed cutting $485 million — a third of the school’s funding — from its budget . Although Cuomo recently announced his intention to offer free tuition to students coming from families making less than $125,000, his track record gives us reason to pause. Considering that CUNY faculty have received no pay increases in six years, and that adjuncts — many earning less than $30,000 annually — teach half of the school’s students, increasing financial support for students will not restore public universities to their full potential. Robust spending on all aspects of public institutions, including living wages for all faculty and service staff, is just as necessary to promoting successful universities as reducing the cost of admission. It clearly is not the case that plausible increases in education quality and attainment will have a substantial impact on inequality. This will require much deeper structural changes in the economy. 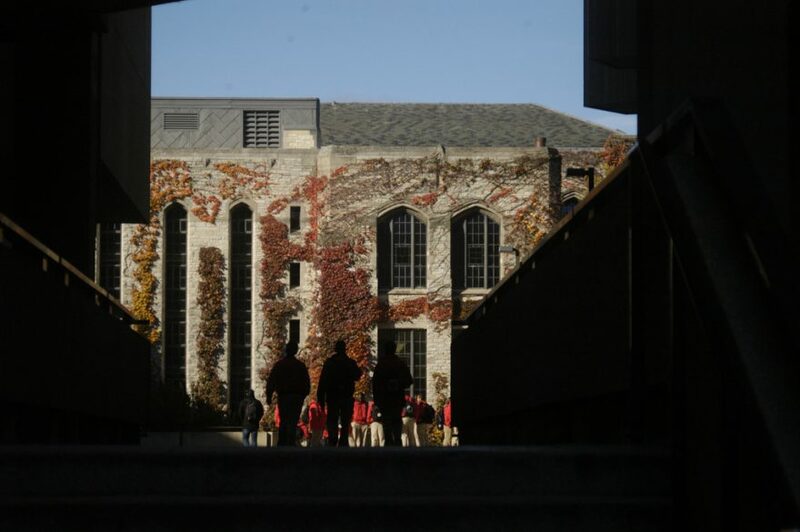 Only 1.7 percent of Northwestern students come from poor families and become wealthy adults. Any suggestion that elite schools actually challenge class hierarchy creates a meritocratic myth. Stories like the Obamas’ help perpetuate the illusion that any American, regardless of their origins, can join the 1 percent if they work hard enough. The visibility of a small handful of high-profile success stories obscures the limited possibilities afforded to most poor students. Elite universities will never offer genuine, mass opportunities for advancement for working-class people. We have to restore public university funding and reduce costs to expand access to higher education to all. Tanner Howard is a freelance journalist and In These Times editorial intern. They’re also a member of the Democratic Socialists of America. Elite universities don’t offer poor and working-class students class mobility — they maintain a rigid class hierarchy.